The Nested SQL While Loop is nothing but placing While Loop inside another While Loop. Nested loops are very useful, When you are working with multi-layered data because when we want to select the layered data, we have to use this Nested While loops to extract the layered data, but please be careful while using it. Before we get into the example, let us see the syntax of Nested SQL While loop. If you observe the above syntax, We placed the While loop inside another While loop. We already explained the While loop syntax in our previous article so, please refer SQL While Loop article to understand the loop functionality. Step 1: First, Compiler will check for the condition inside the first While loop. Step 2: Compiler will check for the condition inside the second While loop. If the condition is True then the group of statements inside the second While loop will be executed. It means, SQL Server will execute statements from Statement 1 to N.
This SQL Nested While loop program will print the Multiplication table of 1 and 2 up to 10. To do this, we are going to nest one While loop inside another While loop, this is also called as nested SQL While Loop. In the next line we used while loop with expression. If the expression result is true then, it will enter to Nested While loop. 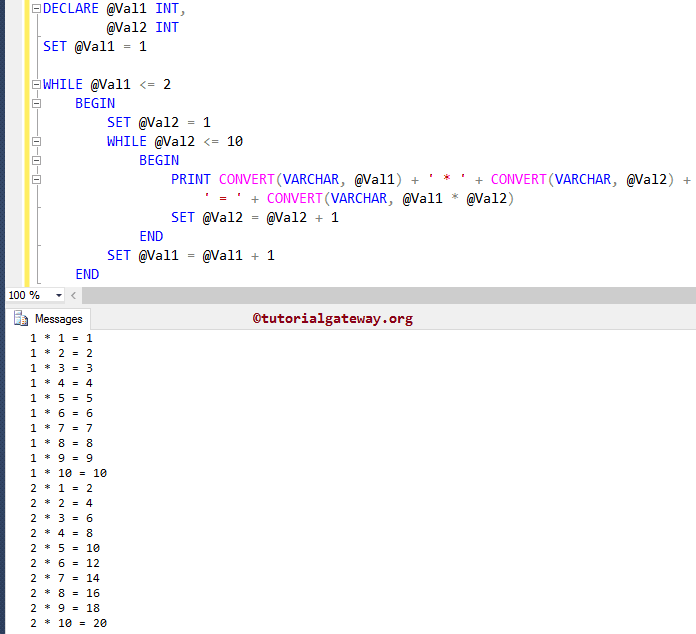 From the above screenshot you can observe that, this program prints multiplication table for 1 and 2. Next, the @Val2 value will be incremented by 1 (SET @Val2 = @Val2 + 1). Please refer Arithmetic Operators article to understand the + notation. This process will repeat until @Val2 reaches to 11. Once the condition inside the second While loop fails, compiler will exit from second While loop and @Val1 value will be incremented by 1 (SET @Val1 = @Val1 + 1). Next, the @Val2 value will be incremented by 1 (SET @Val2 = @Val2 + 1). This process will be repeat until @Val2 reaches to 11.Once it reaches to 11, the condition (11 <= 10) inside the second While loop fails, so compiler will exit from second While loop and @Val1 value will be incremented by 1 (SET @Val1 = @Val1 + 1).